Pictures are on FB so will go away anyhow..
FYI, if it was gusty and that was a peak gust, someone who spent the time reefing would have been left way behind and missed out on some fun sailing during the gust.. From your chair.. you cant tell that is was gusty that day.. The more I read on the forum and take in your opinions and experiences experiences the more I lean to a TI. Budget is a priority, and one TI will help there. We are sailors first and kayakers seconsd and forum comments to articles seem to usually say the TI is a better sailing vessel than the AI. One caveat though, for pre 2015 modes (where you can find one listed between $4-$5k). Thay Seat! Man that pre 2015 seat makes me sore just looking at it! When we looked at a new TI the other day (actually all they had in the store was a new tandem kayak (a revo maybe?) they said it was the same seat) that seat just about sold me then and there. I NEED a recumbent seat. Reclining my back and raising at least my bum leg are required much of the time. Has anyone come up with a seat like the vantage or similar? If so, any links to what you bought? Or a diy seat? Otherwise, if we buy the old model and need to buy one (or two) vantage seats you might as well buy new. Keep in mind we are super handy ppl and restored large and small boats so any mod is pretty much possible by us, so please share what ya got. In fact, some things we prefer to be missing or a project so the budget allows for customization. Frankly, Sailorv, I like that old cloth seat, but I cushion it, literally, with the i-cushion--an inflatable cushion. So, when we bought our Tandem, I had the choice of a new 2016 tandem with the new seats, or a 2014 tandem (also new, out of the box) which had side handles and the cloth seat. I never gave a moment's thought to the cloth seat (I like it), but chose the 2014 because it had side handles and probably did not weigh as much as a new 2016. Again, the i-cushion is what makes the cloth seat comfortable. Highly recommended if you buy an older Tandem. If you buy a new tandem, hopefully, you can get the seats adjusted to your liking. People have put in Vantage seats into AI/TIs. Maybe do a search on Islands and seats. Here is Henry Ovares and his upgraded seat. Really, okay that's interesting. Now it ia not as dry as the new TI though, right? Because the seats shape in the hull is deeper in the 2015 and up? Does the pre 2015 seat recline? Similar to the vantage? Honestly, that seat was a little firm, but I would would would add a waterproof cushion/gel pad or something like that. Do you know how much the weight difference is between the newer and older hull? I would prefer lighter since we might be car topping. Yes, his seat looks good to me. Thanks for sharing! SailorV--here is a discussion about the weight of the new boats. You can't go by what Hobie says on their site--it may not be correct. When Fusioneng says his hull weighs 100#, that is his 2012 hull. FE also says the Tandem is only a little heavier than the AI 2. I think it is on the order of 50-60# heavier, i.e. 185# vs 245#(or more.) You can call that a little or what ever you want. Still, 2 people can handle a Tandem, even on a camping trip. I'm older, as one person says, older than dirt. So, it is not easy for me and my partner to move a Tandem around, but often there is a group of people, and we all help moving the boats up above the high tide line. The cloth seats have straps to raise and lower the back. They work for me. We have completely different purposes for our boats from each other, your concern is always to be able to drag the fully configured and loaded boat up above the high tide mark (which I know can be daunting). I don't really care about that, my biggest concern is how heavy is just the main hull itself and how easy is it to load just the basic hull with everything completely removed out of the boat, (ie... all seats, mirage drives, etc, with the only just the empty hull), and how the heck to get the dang thing on my roof. 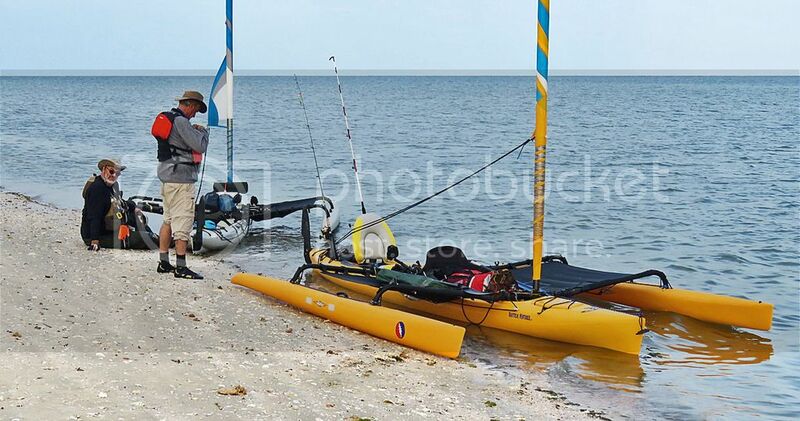 We have about 250k road miles with trailers in tow and Hobie mirage sailing kayaks on the roof over the last ten yrs or so, (prior to that it was canoes). We are actually going on another monster 3 month trip this summer, trying to visit as many national parks as we can, I'm guessing by the end of the summer we will have another 8k to miles under our belt. Our TI is a 2012 model, and our old Oasis was a 2007 model, I don't know beans about any other boats. But I have loaded our boats on and off of roofs if I had to guess at least 500 times now (I honestly have no idea, don't keep track). There is definately a set routine on how to do it all by yourself ( I've never had any help, not even once). I'm just an itty bitty old fat guy (mid 60's... 5'6" and 230lbs). I weighed our old Oasis hull and it weighed 90 lbs. I weighed our 2010 TI empty hull and it weighed 100lbs, our 2011 weighed 103 lbs, and our 2012 empty hull weighed 105 lbs. This is all with everything possible removed from the boats (including all seats, mirage drives, gear, (and water lol)). 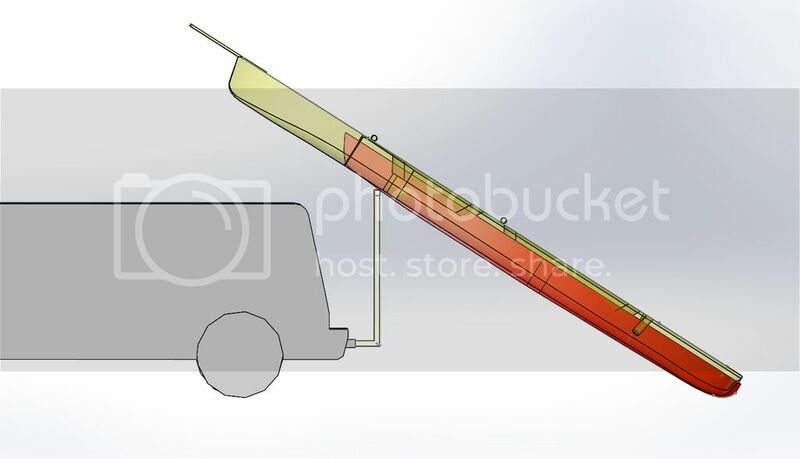 As you can see from the pics below, with the Oasis and the TI in loading position, there is a huge difference in the fulcrum point when lifting the rear of the boat (the hard part). Lifting the bow part is actually pretty easy, especially if you have one of those tilting T bars. Where I have gotten hurt a couple times is lifting the rear (mostly the Oasis, never the TI). Showing both Oasis and TI in ready to lift position, (notice the balance point), with the Oasis you are dead lifting 85 lbs, with the TI you are dead lifting under 60 lbs. 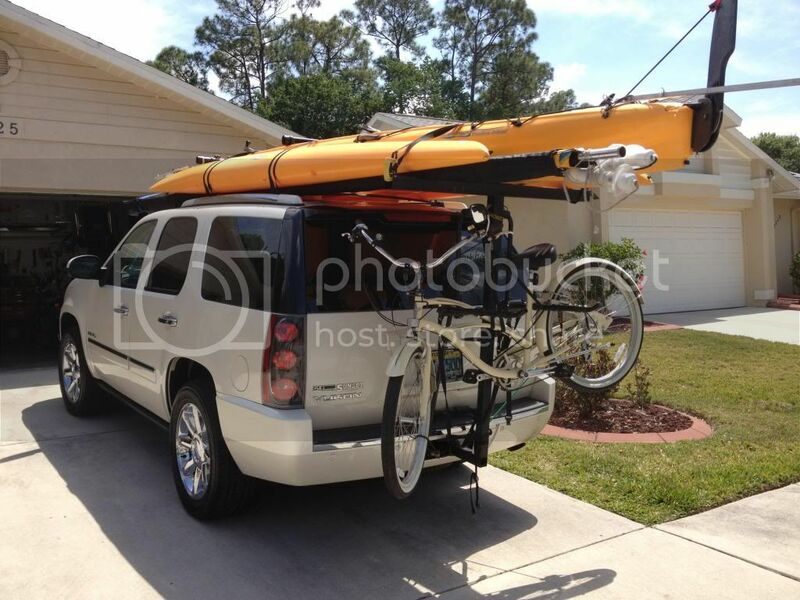 Here is one of our old Yukon Denali's (we wore out three of them) with the boat ready to go to our Key west house (without our camper). 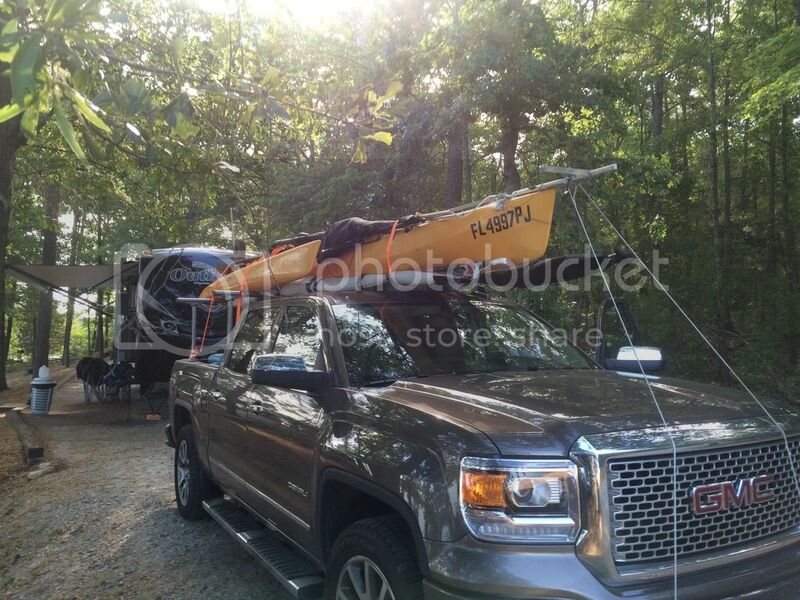 For many years we made that stupid 350 miles trip once a month, kayaks on the roof. This is our current setup (camper in background), where our TI will live hopefully all summer. What we have now takes me much less time to get down than our old setup, where we had an Oasis and a revo up on the roof, (and sometimes a second revo, (3 boats on the roof). What a PIA that was getting all that down and rigged all by myself. The boats lived on the roof all thru summer, late may thru early sept ever year. 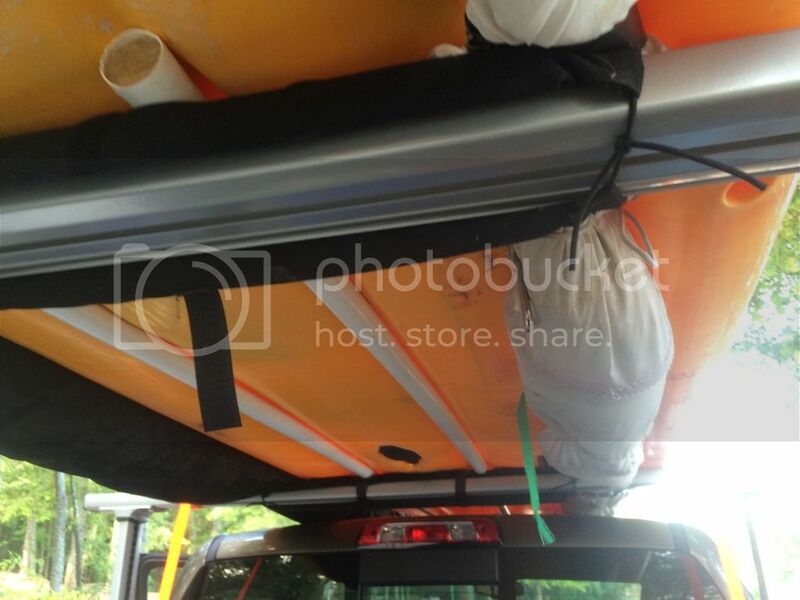 Wooden 1.5" dia cloths line poles (home Depot) just laying on the roof rack (not tied down) are the best method I have found for supporting the boat on the roof in the hot sun all summer. 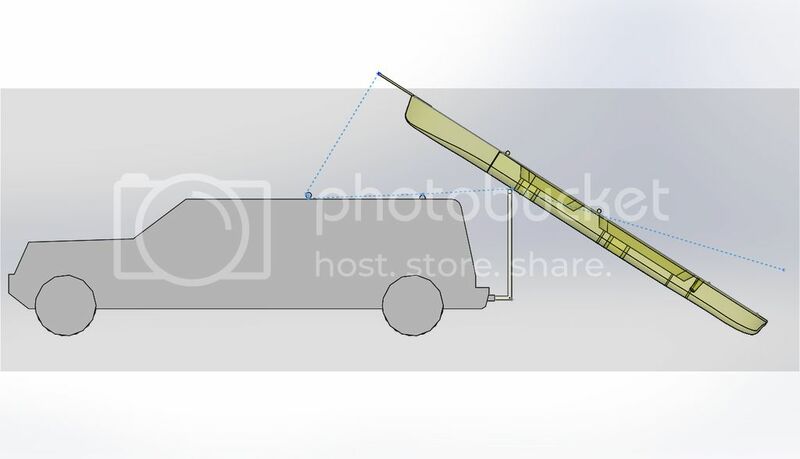 When the boat is not on the roof, everything is removed from the car (no remaining roof racks), this way you can park in parking garages and such, (lol, I tore off a set of roof racks going into the garage at Tampa airport once (oops). Of course when local we just keep the boat on our boat trailer in the garage (the boat lives in the garage on the trailer when we are home). Takes all of five minutes to pull out of the garage, hook up and go. I don't know what to tell anyone else, I have no idea about the other models, or the newer version of any of these boats. I have never been in an AI or AI2, so I know nothing about them. 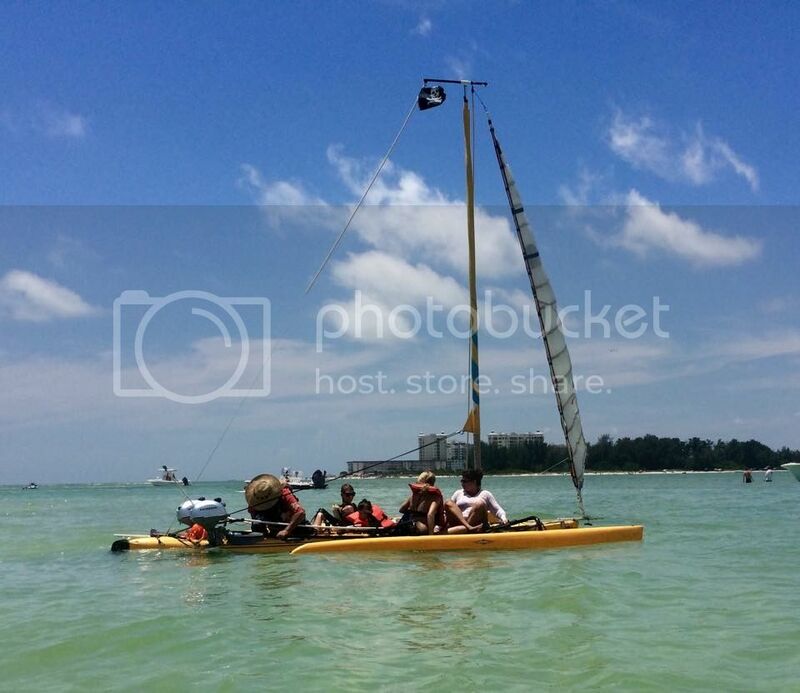 We almost always have 3-4 people along, so having the TI as our general purpose familys boat works out well for us. Thanks for the link Keith, I'm going to check that out. FE thanks a lotnfor the pics and details. That's going to come in handy. The drawings at great! We like to mod all boats (and will be eventually adding a jib or genoa) so your stern mod is pretty interesting. Without the engines, how much faster do you sail with it on? Re weights: My 2010 TI bare hull weighs approximately 58kg /128lbs. Before we got our TI I had two AI's. I found the loading/setup/clean up involved with two boats a real pain. One TI was so much simpler in usage that I sold the AI's. The TI does all the AI did and more, solo or double! After a year or maybe even two of talking about an AI/TI and mulling over our goals and what to do we pulled the trigger. We are in the club now! Officially 2014 TI owners here in the SF Bay Area!!! Awesome! Welcome to the club. You are gonna love it. Congratulations! Thanks everyone. So far so good. 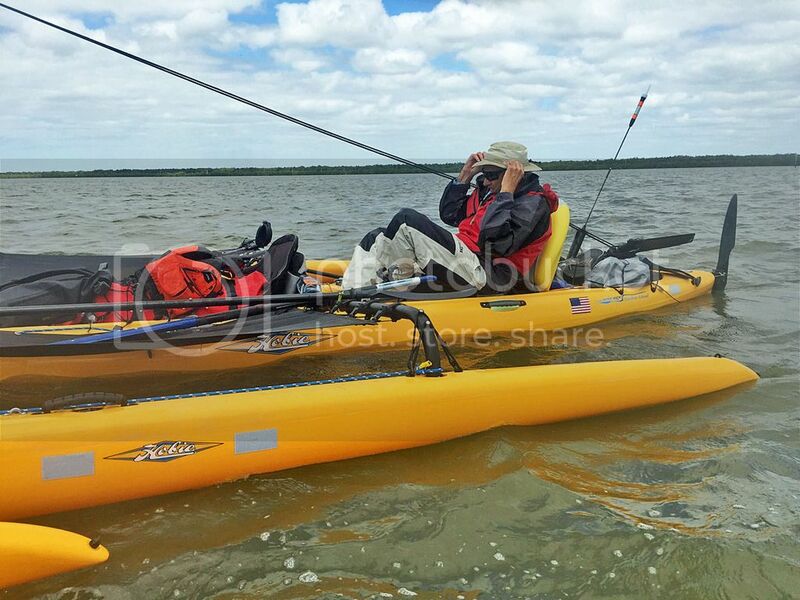 We have been out three times: kayak only, kayak w/akas, sailing. Each option is impressive and fun. Great design. 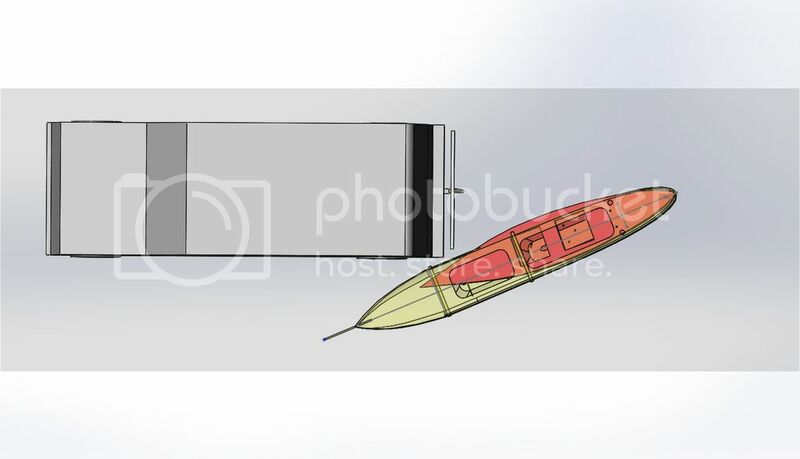 Looking forward to making a few mods (tiller extension, whisker pole, genoa, etc).